Editor's note: Read part one of Ryan's North Island adventures here. After going on a luxury cruise and a helicopter ride during my first two days of adventure on New Zealand’s North Island, I would have been perfectly happy never seeing anything beautiful again, given how grateful I was. But my final two days on the North Island—complete with mountain biking in the redwoods, visiting Hobbiton and enjoying world-renowned spas and wineries—were proof that New Zealand has a vast array of attractions and natural sites to explore and absorb (also, proof that this world has a vast amount of beauty). For those even vaguely interested in traveling to New Zealand, here are a few more things you should keep on eye out for on the North Island. And for those of you who aren’t interested at all, you need to expand your mind, man. After a busy two days, there was plenty more adventure to be had. Whakarewarewa Forest in Rotorua is world-renowned for being a mountain biking mecca. Through Mountain Bike Rotorua, co-owned by Multi-Day Adventures, you can explore more than 140 kilometers of biking trails in dense redwood vegetation. Trails are ranked from one to six in difficulty, with one being for beginners and six being for the die-hards. I was guided through one of the easier trails, but that was adventurous enough. We winded through fern heaven (there are 500 different varieties of ferns in New Zealand), up and down hills, across bridges and babbling brooks and through some open spaces that gave you a stunning look at the surrounding redwoods. All of this while riding premier four-suspension Giant bikes (my bike was 20 speeds). You ride through redwood forests like in Whakarewarewa and you realize just how stunning and colossal our natural world can be. Whakarewarewa encompasses 5,600 hectares, or more than 13,800 acres. What the New Zealand government has done in preserving and adding to the redwoods is something to be tremendously proud of. The government set up a nursery as far back as 1898 and, through much research and testing (170 different species of trees were planted in a trial area), it was determined that the California Coast Redwoods were the most suitable trees for Whakarewarewa (native New Zealand redwoods grow very slowly). In 1901, the first California Coast Redwoods were planted. The redwoods were opened to the public in 1970, the first mountain bike trails were built in 1993 and the rest is history. And if you are looking for true impartiality, consider that Australian Mountain Bike Magazine ranked the Whakarewarewa mountain bike trails as the best in the world. Red Bull ranked Rotorua’s mountain bike trails as the eighth best in the world in May 2013. As a born-and-raised Northern Californian, Whakarewarewa Forest instantly struck a chord with me. I was in bliss from the start, and it reminded me of the redwoods back home. 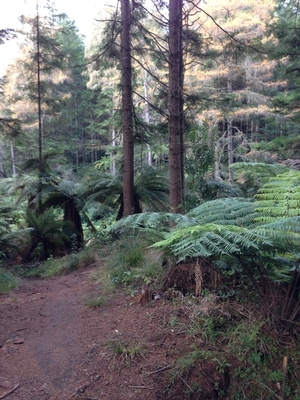 If you like mountain biking, no matter what your skill level, you must visit Whakarewarewa Forest. And the guides at Mountain Bike Rotorua do a fantastic job of delivering a breathtaking experience. Skyline Rotorua—a top Rotorua attraction—features a gondola, luge tracks, ziplining, a winery, a restaurant, New Zealand’s only Jelly Bean store (over 100 flavors) and a thrilling ride called the Skyswing that catapults you above the vast scenery below. After plenty of exercise in Whakarewarewa Forest, I was treated to wine tasting at Volcanic Hills Winery and dining at Skyline Restaurant, along with everyone in the media group. The winery opened in 2009. It, of course, showcases New Zealand’s premier wine, sauvignon blanc, as well as various pinots and chardonnay. About 3,000 crates of wine are sold annually, according to winemaker Sean Beer (yes, his last name is really Beer). During the wine tasting, Beer talked a bit about New Zealand’s budding wine market, which is “growing each year.” There are approximately 750 wineries in New Zealand, and plenty more will sprout up in the coming years. The wine was, unsurprisingly, top-notch. But don’t take my word for it. On TripAdvisor, visitors have rated Volcanic Hills Winery five out of five stars. As for Skyline Restaurant, not only does it offer stunning panoramic views of surrounding Rotorua, it was also awarded New Zealand Beef and Lamb Excellence Award this year for the second year in a row. There is a vast selection of carved meats, as well as a wealth of seafood choices, including crab, mussels and scallops. I also had butter chicken for the first time at Skyline Restaurant and, well, that was delicious. It took me going on an adventure in New Zealand to try it, but, rest assured, I will be scouring the United States for the best butter chicken in the wake of that glorious tastebud explosion (what a story that would be!). My belly was about as stuffed as it could get after dining/stuffing my face at the restaurant, so going to a relaxing spa was a sure-fire way to ease a full-grown man into a deep coma. If you like spas (or relaxing, or being happy), you may want to consider Polynesian Spa in Rotorua. For one, it’s been named among the world’s top 10 thermal, medical and natural spas six times in the past decade by Conde Nast Traveller. Secondly, it boasts 26 hot pools, 14 of which neighbor Lake Rotorua. There are also two different mineral waters used to accommodate those who want to rest tired muscles and/or those who want a natural skin treatment. On top of that, there are four different bathing areas, from an adults-only section to the Family Spa. After a big day of mountain biking, easing into the various pools—each with different temperatures—was just what I needed. Somehow, I was able to stand up on my own two feet and head back to Distinction Rotorua with the rest of the media group when it was time to leave. I could have sunk into those pools all night long. First of all, if you think Hobbiton is just another tourist attraction, or just another movie set for that matter, you are gravely mistaken. 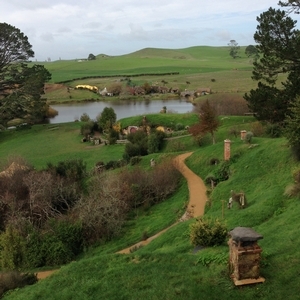 Of all the places I went during my four-day post-TRENZ trip, Hobbiton surprised me the most. It wasn’t that I didn’t expect Hobbiton to be grand; it’s just that it was more than I could have ever imagined. Set on a 1,250-acre working farm, the 12-acre “Shire” is a sight to behold. If you had casually wandered onto the property and never heard of the “Lord of the Rings” or “Hobbit” trilogies, you would swear that this was actually a village where people lived. There are 44 “hobbit holes” or hobbit homes on site, and the level of detail put into Hobbiton is absolutely incredible. Learning about the site gave me a new appreciation for director Peter Jackson and the people who made the widely popular movies a success. The amount of thought put into Hobbiton is extraordinary. Via vinegar solutions and painting techniques, the wooden facades on the hobbit holes look as if they have been around for 100 years. Each hobbit hole tells a story; gardeners, painters, carvers, potters, woodmen, the little old woman across the Shire, even the town drunk, are all accounted for, as tools and gardens litter front yards. Even the grass is cut precisely in different areas to create the illusion of well-tread paths. The town drunk, for example, doesn’t cut his grass. Heck, one crewmember was even responsible for taking clothing to and from clotheslines. Not only did it procure authentically washed clothing, the crewmember also naturally created a worn-out path to the clotheslines during his 10-day assignment. On top of that, the hobbit holes are different sizes to highlight the size of different characters in the movies. For example, Gandalf appears in front of smaller hobbit holes to create the illusion of him towering over the hobbits, while the “hobbits” are strategically filmed in front of the bigger hobbit holes to make it look as if the homes are suited for their small stature. According to Russell Alexander, owner of the family farm and general manager of Hobbiton, nearly 1,000 people worked on the first “Hobbit” movie, divided into two separate filming/production sessions. 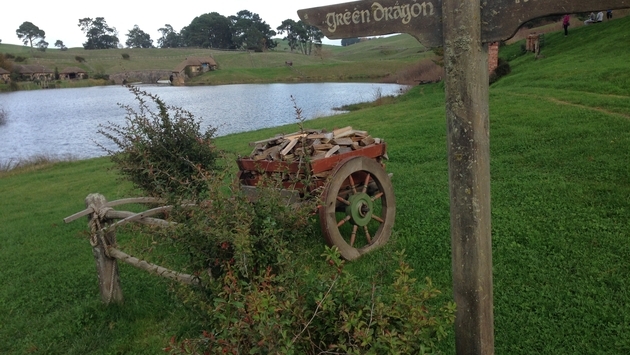 Of course, there’s also the Green Dragon Inn, which serves four different types of beer straight out of the barrel and vegetables grown in the Hobbiton gardens. The meal our media group had was delicious, from the beef to the salads to the potatoes. I could see why several people who had visited Hobbiton before told me I was in for a treat before I even visited the Green Dragon Inn. As I walked back to our transportation, passing by the Hobbiton lake and surrounded by rolling hills, countless sheep and wide-open sky (no power lines or 20th-century structures here), I had to constantly remind myself that this was indeed a movie set and not a real village. Hobbiton offers group tours and private tours, as well as event space for incentive and corporate occasions, whether you want to party, treat people to a gala dinner or host a networking function. On June 4, Hobbiton will be opening up a new venue that will be able to accommodate up to 250 people. My New Zealand trip ended with a tour of the highly praised Villa Maria Winery in Auckland, complete with wine and food tastings. The tour was quite fascinating, as our guide went through the whole process of the winery’s winemaking and distribution. Villa Maria Winery has been able to stake claim as New Zealand’s most awarded winery for more than 30 years, garnering numerous awards as a top winery in the world. You can tell the company has a deep understanding of winemaking when you are learning about such things as its fermentation process, what temperature its wines are stored in, which foods go well with which wines, the wine industry or the history of New Zealand wine. Villa Maria Winery has three different levels of wine (“reserve,” “seller selection,” and “private bin”), but much like established wineries in, say, Northern California’s world-renowned Napa Valley, even its reserve wines stand out. The winery was established in 1961, at a time when New Zealand’s wine industry was virtually non-existent, but it has helped lead the charge in making the country a growing wine destination. I knew I liked the wine when I looked down at my tasting glasses and realized every one of them was empty, then looked around the table and saw that no one else in my media group had come close to finishing theirs (and, no, I’m not a wine binge drinker). Villa Maria Winery is set on 105 acres of land, complete with 25 acres of vineyards. For being so close to the Auckland Airport, it’s fascinating a) how picturesque the property is and b) how quiet it is. I’m still trying to wrap my head around how I didn’t hear a single plane (impenetrable force fields?). New Zealand’s wine industry is just starting to blossom, and, with establishments like Villa Maria Winery, it’s no wonder why.